Summer is here and NRBQ is back; that’s cause for celebration on both counts. Well known for unusual musical pairings and rollicking live shows, the band is better and looser than ever: Who else would adapt Tchaikovsky’s “Piano Concerto No. 1 in B-Flat Minor” to a loping country song? That’s exactly what keyboardist/frontman Terry Adams has done on “In Every Dream”, a composition residing somewhere in the odd hinterland between classical and country music — an impressive creation indeed. “Boozoo and Leona” opens the joyful return of NRBQ (New Rhythm and Blues Quartet, for the uninitiated) with a loving and infectious tribute to zydeco king Boozoo Chavis, with whom Adams has produced and shared numerous stages. Adams is the lone original member of NRBQ, other members having either retired from the road or moved on to their own projects. The title track opens with a flurry of gospel piano chords and then shifts into high gear for a pop joyride. “Keep This Love Goin'” could be the closing-credit music for a very satisfying romantic comedy starring, say, John Cusack and Lenore Zion. Playing as NRBQ since the late ’60s with various members, Adams took a leave of absence from the band in 2004 after being diagnosed with stage 4 throat cancer; upon his return, the other members had decided to go their own ways. In 2007 Adams began performing with other musicians as The Terry Adams Rock and Roll Quartet (Scott Lignon, guitar, bass, vocals; Pete Donnelly, bass, guitar, vocals; Conrad Choucroun, drums) and with this album, NRBQ was reborn with most of the members sharing songwriting credits. There’s even a nod to the increasing trend of rockers recording kids music (so-called kindie rock) on “The Animal Life” penned by Lignon, a rather innocent “grass is greener” look at the simpler life animals lead over their large-brained human counterparts. The song has an incredibly catchy chorus, and my ten-year-old daughter totally adores it. On the whole, this is a supremely joyous and lovely effort. 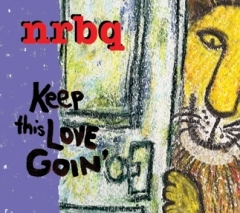 The love is palpable on this album, and it’s apparent that NRBQ loves what they do and have passed that emotion on to their fans. Check out the band performing the classic “That’s Neat, That’s Nice” here in Atlanta. Adams absolutely kills it on keyboards.